Avocados are super food, great for skin and hair and very good for those who want healthy dose of fats nourishing the body every single day. Just about 1/4 of a large avocado will be enough everyday to provide a sizable amount of daily requirement of Vitamins E,C,K and B6 and minerals like Iron, Phosphorus, Manganese, zinc and Magnesium. Avocados have soluble and insoluble fiber that helps the probiotic gut flora, hence the fruit falls into the category of prebiotic foods. 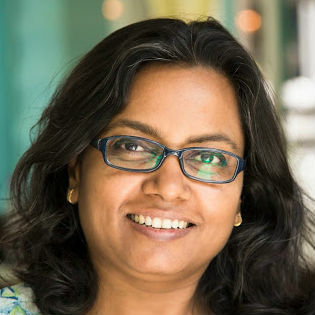 I wish Avocados were available easily all over India but we can plant some saplings anywhere and grow them in our backyard. I have already planted one in a pot because I am fed up of getting rock hard Avocados in the market that refuse to ripen and become blackened at the margins even if they decide to ripen. This happens when the Avocado was plucked too early from the tree and was not ready for ripening. The right Avocado is the one that has been plucked off the tree when it is ready to ripen but it will be good to know that Avocados do not ripen on the tree. 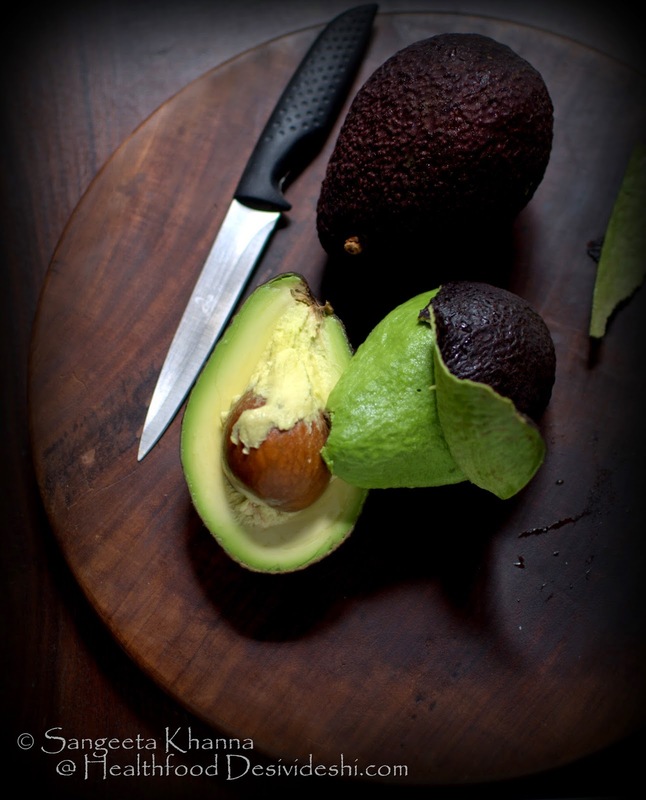 After plucking the fully grown avocado ripens within 2 weeks but if the avocado was plucked early, it may not ripe well and would not develop a good flavour even when ripe. Raw avocados are a horrible taste so don't ever try to use them else you will be put off this wonderful fruit for ever. 1. The avocado you pick up should not be rock hard. It should be give in to pressure just like ripe mangoes. When you press the skin a small dent should be formed. This is the right stage to use Avocados but a little harder than this fruit would need 2-3 days or a week to ripen. 2. The skin colour of Hass Avocados turns a nice purplish red or brown when fully ripe. 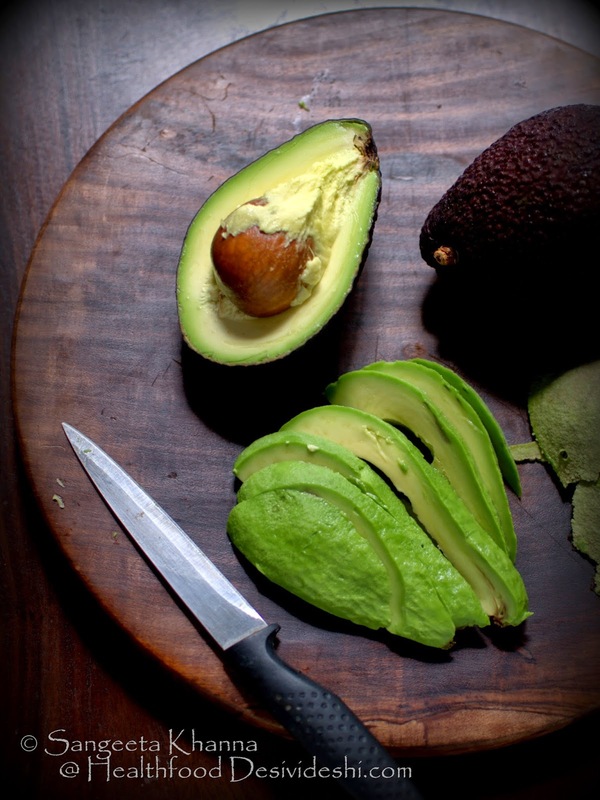 Hass Avocados are the ones with a crinkled skin so look for the colour and texture shown in this picture. 3. The area adjacent to the stalk sinks a bit when the fruit is ripe and the stalk comes off when pulled. I have tried to show this in the picture above. 4. 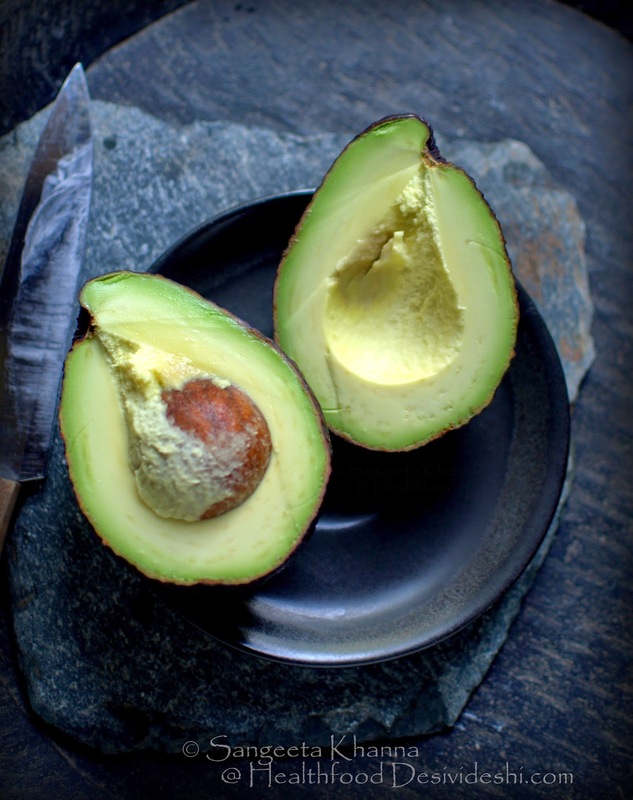 The skin peels off the avocado easily when it is fully ripe. 5. The green skinned Avocados available in India are the Hall and Choquette varieties. 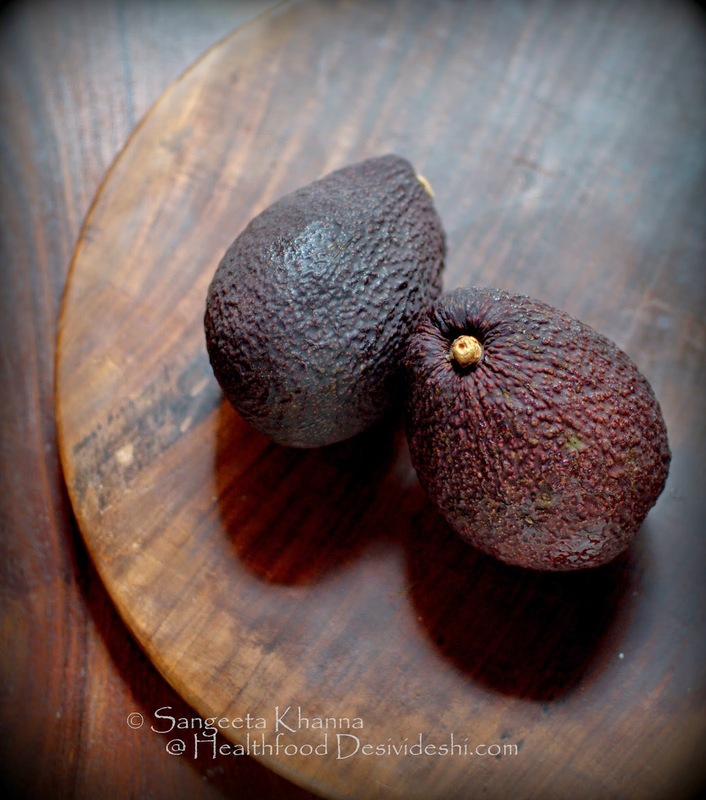 These have smooth and shiny skin but it turns a bit dull and brownish as the Avocado ripens. So look for the right skin colour and how the skin gives in to pressure to ensure the avocado it ripe when you buy. 6. If you decide to pick up slightly raw Avocados and use it after a few days, just wrap them up in a brown paper bag along with a ripe Banana to the Ethylene released by ripe Banana helps the Avocado to ripen. Never Microwave the Avocado to make it soft when it is still raw, as it results in a horrible taste. 1. Let them ripen naturally and use them uncooked. Avocados are best when uncooked as they contain omega 3s (including Oleic acid) and phytosterols (see here) and the fatty acid structure changes a bit when it is heated. Although it doesn't get harmful when cooked. But getting a best nourishment form an expensive fruit makes sense for me. 2. Eat Avocado along with some yogurt or citrus fruits to help absorb all the Calcium, Fatty acids, Iron and other minerals from both categories of food. 3. Peel off the skin thinly and do not discard the dark green flesh just adjacent to the skin as this is the part where most carotenoids of the Avocado are concentrated. It is better o let the Avocado get ripened to the stage when the skin can be peeled off just like a banana peel (picture above) and not to scoop put the flesh from the halves. 4. If the Avocado is used along with lettuce greens, Rocket and carrots etc, the Carotenoid and Lycopene absorption increases many fold even if there is no oil in salad dressing. 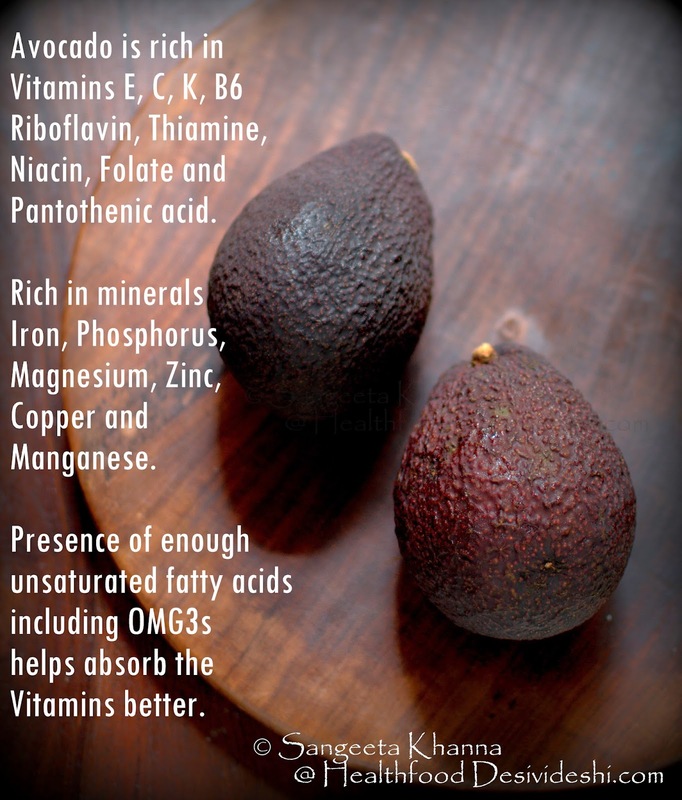 The fat in Avocado is enough to enable better absorption of these pigments and provide benefit of these antioxidants. 5. If you want to use Avocado for soups you can cook a stock or body of the soup along with seasonings and add chopped or pureed Avocados after the cooking is over. This step preserves the nutrients in the fruit. 6. If someone doesn't like the taste of avocados make mayonnaise or dips using Avocados and add seasoning and herbs as per taste. The pureed avocado takes on whatever flavours you add to it. This may or dip would fit into any kind of meal plan. 7. Use the Avocados as soon as they are ripe. It can stay well for 3-4 days in refrigerator but the nutrients start diminishing once the flesh starts blackening. 8. If you need to store chopped Avocados in refrigerator, take care to douse them with either lemon juice or yogurt or an acidic salad dressing depending on how you are going to use the chopped avocados. If stored exposed the avocados turn black and look unappetizing, nutrient value is affected only marginally. Would you be eating more Avocados after reading this? They really are a versatile ingredients and not just a healthy fruit you must bring home. Here are a few recipes I love making again and again. Chill all the ingredients before assembling the dessert and serve it right away if so required. Whip the hung yogurt nicely. I did not add any sugar to the yogurt as the strawberry preserve is sweet enough. Now add the strawberry preserve and mix lightly, making streaks of red and white. Taste for sweetness and add a little more if required. Now chop the avocado flesh in small cubes and add to the yogurt and mix lightly. Fill in serving glasses and serve right away. You can refrigerate the dessert for a day but take care not to keep any bits of avocado exposed to air on the surface of the serving glasses. Push all the avocado in the middle so it gets covered with yogurt, else it will get black. I invariably end up eating this the next day and always feel the flavours get enhanced the next day. This dessert can actually stay well for 2-3 days in the fridge is the container is sealed well with cling film. The yogurt keeps it fresh and creamy although the colour may get a bit dull after 2 days. If you have extra Avocados just make smoothies with them. I say make smoothies even if you have to buy Avocados just for the smoothies, the y are totally worth in a smoothie as well. 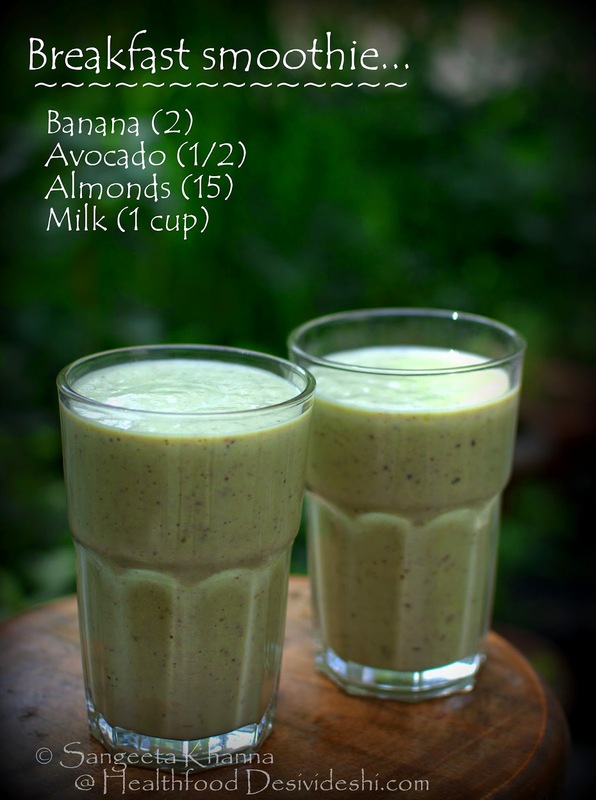 This Banana avocado almond smoothie is a super satisfying smoothie that keeps you full for more than 4 hours trust me. I have depended on it whenever I am expecting a late lunch and want to skip lunch for some reason. 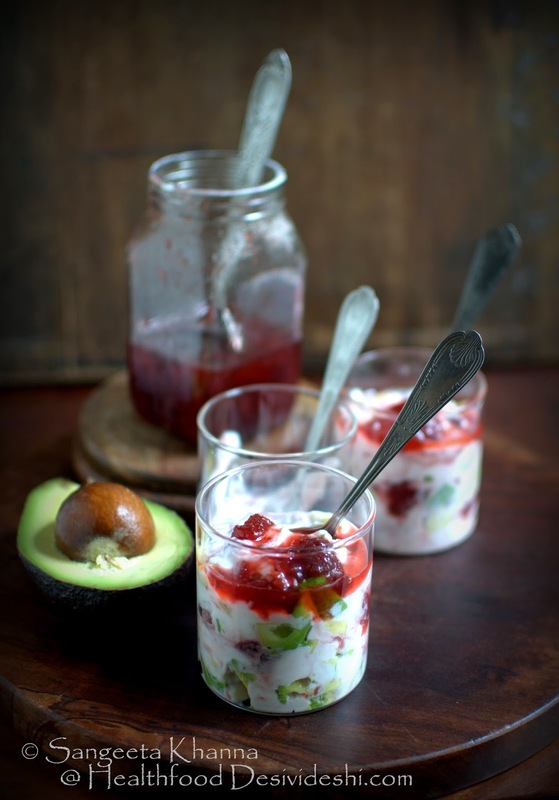 The avocado strawberry yogurt is a rich dessert too. I recommend it in small servings if you are serving it after a heavy meal, but large servings are okay with a lighter meal. 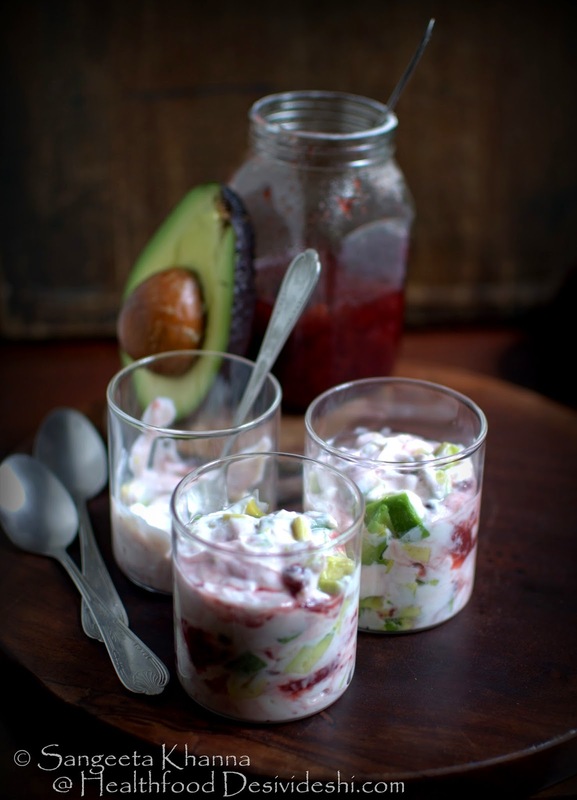 This avocado strawberry yogurt could be a dessert for a diwali party as well. Would bring you some brownie points for sure.